The K League Classic moves into round 22 with an interesting summers weekend of fixtures. The highlight game this round of games is the mid table clash between Incheon United and Seongnam FC, both sides have shown huge improvements in form recently and both are hoping for a top half finish before the league table split. The league table is still close in the middle but gaps have started to appear. 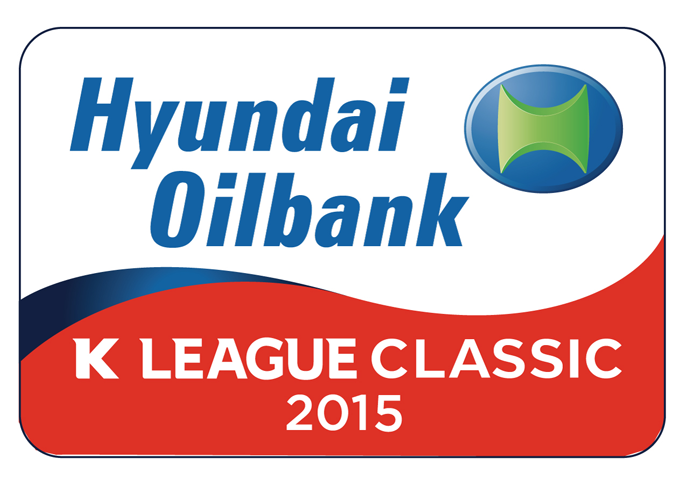 Jeonbuk Hyundai have regained some of their lead recently at the top and are 7 points clear. Suwon and Jeonnam are just behind them, with Seoul, Pohang and Seongnam completing the top half. Incheon, Jeju and Gwangju are separated by just 2 points in 7th-9th. Then come Ulsan, Busan and finally Daejeon who are 8 points adrift completing the table. Jeju United have won 2, drawn 2 and lost 2 of their previous 6 games. League leaders Jeonbuk Hyundai have 3 wins and 3 draws from their last 6 games. Jeonbuk will be slight favorites here, but Jeju at home won’t go down easily. FC Seoul have won 1, drawn 3 and lost 1 of their last 5 games. Pohang Steelers have lost 2 and draw 1 of their last 3, bringing their strong run of form to a halt. This one looks close on paper, however Seoul are generally good at home so we’re giving them a very slight edge. 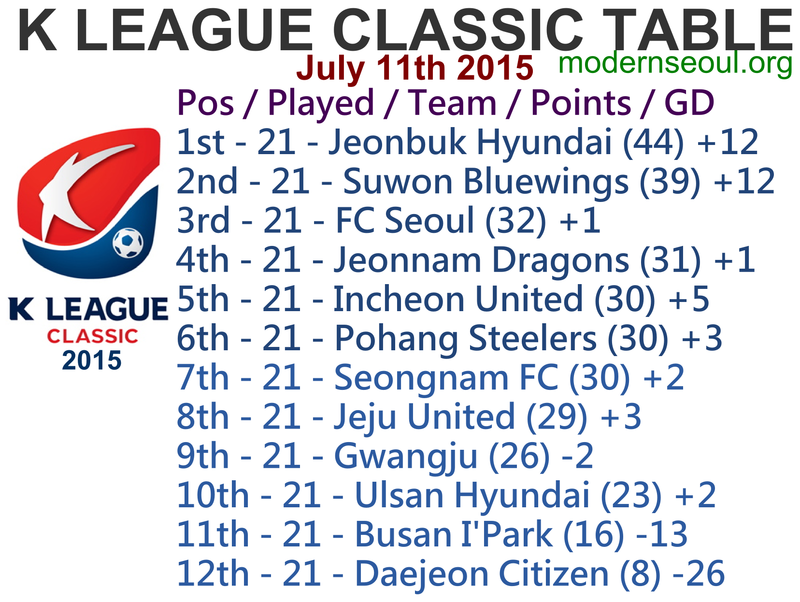 Ulsan Hyundai won during the week for just the 2nd time in 17 games. But it was vs. bottom side Daejeon. Gwangju have lost 2 and drawn 3 of their previous 5 games. Neither side is on great form, and a draw looks the likely outcome. Incheon United are unbeaten in 6, winning 4 of those and have the tightest defense in the league, conceding just 17 goals all season. Seongnam have won 3 of their last 4 games, helping them move up to 7th. Both sides are on strong form and don’t concede many goals. Therefore a draw seems most likely. Daejeon Citizen have only picked up 8 points all season, and have lost their last 3 straight. Jeonnam Dragons were unbeaten in 8 before Wednesday, but are still in 4th place. Jeonnam will be favorites, but Daejeon as always have nothing to lose. Busan have just 1 win in 9, and have lost 5 on the bounce. Suwon Bluewings have 3 wins and 2 draws from their previous 5 games. Suwon will be big favorites here, Busan will have to improve hugely to get anything from this game. 2 correct results with no perfect scores. Round 21: 2 correct results with no perfect scores. Round 20: 4 correct results with 3 perfect scores. Round 19: 5 correct results with 1 perfect score. Round 18: 2 Correct Results with 1 perfect score (same as the previous 2 weeks). Round 17: 2 Correct Results with 1 perfect score. Round 16: Only 2 correct results with 1 perfect score, 2 surprise away wins and a couple of dull 0-0s didn’t help. Round 15: Only 1 correct result, in a weekend of very surprising results. Round 14: 3 correct results but no perfect scores. Round 13: 3 correct results but no perfect scores. Round 11: 4 Correct results but no perfect scores. Round 10: 2 Correct results with 1 perfect score. Round 8: 3 Correct Results with 2 perfect scores. 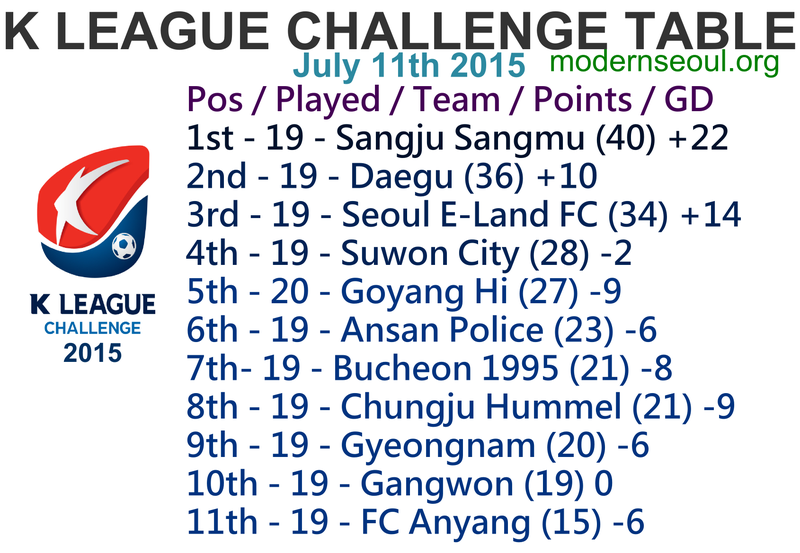 The K League Challenge moves into the 22nd round of the 2015 season. The highlight game of the this round of fixtures is the Army vs. Police or Sangju Sangmu vs. Ansan Police clash, this is always a competitive game and often creates talking points. The league table has now started to take shape, Sangju Sangmu now have just a 4 point lead at the top of the table ahead of Daegu, Seoul E-Land and Suwon who make up the playoff places. Goyang are only behind them by a single point. Then come Ansan, Bucheon, Chungju, Gyeongnam and Gangwon who have only 3 points between them. Finally Anyang complete the table, 4 points adrift. Predictions Update: 1 correct result.